The 2018-2029 National Transport Plan, produced by the aviation, rail and road sectors and presented last week, sets out plans to reduce the environmental impact of all forms of transport by the end of 2030, including traffic calming measures. Targets for electric vehicles are ambitious, with the plan setting out a target that all newly-registered cars, light vans and buses should be ‘zero emission’ in 2025, with 1.6 million to be put on the roads by 2030 – claimed to save around 2.7 million tonnes of CO2 emissions. Uptake is to be supported by reduced tax and tolls, as well as selective access to bus lanes. 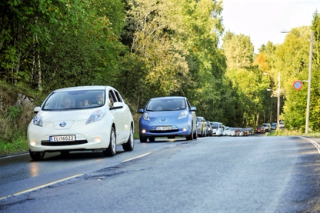 Strong incentives have already made Norway one of the most advanced markets for plug-ins; 22.4% of the 150,686 cars registered last year were fully electric or plug-in hybrid models. The plan also outlines targets for conventional fossil fuel cars to be phased out by plug-in hybrids, or to use biofuels while the move to fully electric cars is underway. The longer-term aim is for all forms of transport to be virtually climate-neutral by 2050.